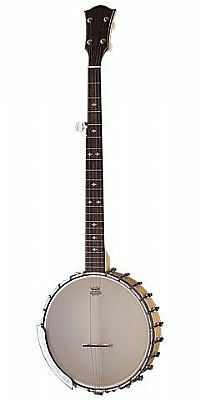 The Countryman California MA Maple 5 string open-backed Banjo inc Hardcase. This 'players' 5 string open-back banjo is a beauty made of Maple with a rosewood fingerboard, with snowflake inlays. The body boasts 2 truss rods, which is unusual at this price-point - but this is a quality instrument! Traditional banjo tuning-heads make a welcome appearance, (as opposed to the standard guitar-type machine heads on cheaper instruments) this open-backed beauty also features an intricate leaf pattered tension hoop. Finally, the classic vintage-style Remo head and attractive double black purfling on the neck, will produce a full-bodied sound, that keeps you coming back for more.